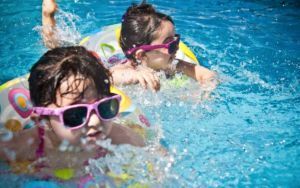 If you are like many families in California, a combination of great weather and the promise of summertime fun leads to thoughts of splashing around in your own or public swimming pools in your community. Although it’s exciting, especially for your little ones, to think about swimming in in their new bathing suits, it’s also a good time for parents to think about pool safety. In 2016, news of a Silicon executive electrocuted in his swimming pool trying to save his daughter horrified everyone who heard about the incident. According to reports, a light in the swimming pool had malfunctioned, electrifying the water. The executive’s nine-year-old child was in critical condition when rescued. Pool Safely Song by Laurie BerknerStaying safer around the pool only takes four simple steps! 1. Learn to swim. 2. Don’t climb or play with gates and fences. 3. Stay away from drains in the pool or hot tub. 4. Always ask a grown up before going in or near the water. For more tips, visit http://www.poolsafely.gov. To hear more of Laurie Berkner's songs, visit https://www.youtube.com/user/TheLaurieBerknerBand Song Lyrics: Four simple steps - Four simple steps That’s all it takes - That’s all it takes Four simple steps - Four simple steps To keep me safe - To keep me safe When I take four simple steps I know how to Pool Safely! I know how to Pool Safely! (1 measure break) Ready? Set? Here…we…go! Learn to swim - ‘Cause swimming’s great But don’t go climbing - Over the gate When you see a drain - Stay away And ask a grown-up if it’s ok to Swim in the pool Safely Swim in the pool Cause being safe is cool Swim in the pool Safely I know how to Pool Safely I know how to Pool Safely (2 measures break) Four simple steps - Four simple steps That’s all it takes - That’s all it takes Four simple steps - Four simple steps To keep me safe - To keep me safe When I take four simple steps I know how to Pool Safely! I know how to Pool Safely! (no break) Ready, set, let's do it again And this time do it with all our friends! Learn to swim - ‘Cause swimming’s great But don’t go climbing - Over the gate When you see a drain - Stay away And ask a grown-up if it’s ok to Swim in the pool Safely! Swim in the pool Cause being safe is cool Swim in the pool Safely! I know how to Pool Safely! I know how to Pool Safely! Four simple steps One golden rule When you’re at the pool - Pool Safely! According to Consumer Reports, small children are most likely to drown in a swimming pool, while older kids are more likely to drown in a lake, river or while at the ocean. In fact, in children ages 1-14, drowning is the leading cause of death due to injury. In those aged one to three, it is the major cause of death apart from birth defects. If your children can’t swim, enroll them in swimming lessons with a reputable trainer. Always appoint a designated watcher when children are in the pool. Caution children to steer clear of drains in hot tubs or pools. Ensure that pools or hot tubes are safely enclosed by fencing with a locked gate. An alarm or buzzer that sounds when a gate is opened or the fence breached is a great defensive way to avoid accidents. Make sure your child understands water safety. It is important to consider pool product certification before buying. Just because a product looks like it would bring a greater level of safety to your pool or spa, looks can be deceiving. A representative of the National Sanitation Foundation warns of what to look for. According to the U.S. Consumer Product Safety Commission statistics, there were 5,600 hospital emergencies in the years 2013 through 2015 related to near drownings and 361 drownings of children under the age of 15 in either swimming pools or spas. The majority were associated with swimming pools accidents. From 2013 through 2015, 66 percent of non-fatal injuries from drowning occurred with children under the age of five. Swimming pools at home residences accounted for the highest number of accidents involving drowning in children under 15 with 56 percent occurring in inground pools, 19 percent in above-ground pools and 5 percent in portable pools. This one is easier than you think. Of course a parent wants to choose a flotation device that works and can help guarantee your child’s safety while in the water. All you have to do before purchasing a flotation device is look for the United States Coast Guard (USCG) seal of approval and assure proper fit and size. Bathing suits with flotation devices and the ever popular water wings for children are not approved. Water wings can actually impede a child’s ability to swim or slip off. The USCG approves five types of flotation devices, and each has advantages and disadvantages, so doing your homework before making a purchase is a good idea. Public pools include community and hotel pools along with pools found in schools. California requires a lifeguard at all public pools that charge a fee and signs indicating that a lifeguard is not present if one is not available. This includes wave pools. In addition, lifeguards are required to take take first aid and cardiopulmonary training courses and be certified. If swimming instruction is provided, the instructor must have a current certificate from the Y.M.C.A or the American Red Cross along with CPR and first aid certification. Drain covers are mandatory. This is required because children can get their hair or appendages caught and be unable to surface. A massive recall in 2013 required any defective drains be replaced before the pools could be opened in 2014. Daycare centers have similar requirements. In addition, supervising personnel must be assigned to children. For children up to 12 months, there is a one-to-one ratio. For older children, the ratio changes. For instance, for children one to three, the ratio is 2:1 while for those four to five, the ratio is 4:1. Fencing for private and public pools must be a minimum of five feet tall. No spaces over two inches between the fence and the ground are allowed. Gaps in fencing may not be larger than four inches diagonally. Gates and doors must be self-closing and self-latching and open outward. Mesh fencing is very climb resistant because of the tension of the mesh. Children can’t grab it or toe hold it. They are available with self-closing key locking gates. There are no top crossbars anywhere on our system making it very difficult for children to grab. Checking with a pool specialist to see which choice is right for you is always a good idea. 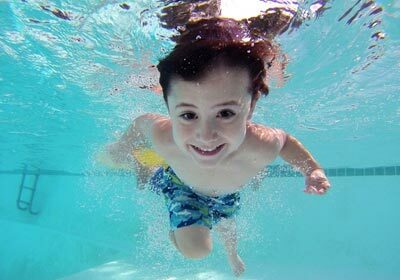 Taking care to prevent swimming accidents keeps the summer fun. However, accidents happen. If this occurs in your family, please contact the Law Offices of David Azizi at (800) 991-5292. David has three children of his own and understands the horror such an incident can cause. While nothing will make up for the loss or injury of a child, recovering damages for such an accident can help ensure that a similar accident will not happen to others.